Everywhere he found boiling resentment, a fierce willingness to fight against the tyranny, but it was undirected, uncoordinated, and, in any modern sense, unarmed. Sporadic rebellion was as futile as the scurrying of ants whose hill has been violated. PanAsians could be killed, yes, and there were men willing to shoot on sight, even in the face of the certainty of their own deaths. But their hands were bound by the greater certainty of brutal multiple retaliation against their own kind. As with the Jews in Germany before the final blackout in Europe, bravery was not enough, for one act of violence against the tyrants would be paid for by other men, women, and children at unspeakable compound interest. – Promotional copy for 1949 edition of Sixth Column, by Robert Heinlein, written originally in 1941. 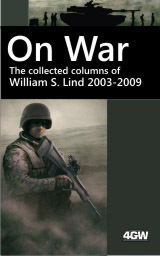 With the release of On War, I have been thinking of the impact of language in science fiction warfare. The sort of thing that the Center of Syncretic Studies looks at in the real, modern world is something that is seen all too rarely in science fiction. The Speaker for the Dead touches on language and alien warfare, but not in a direct strategic military sense. Ender’s guilt is not exactly Sun Tzu personified. Starship Troopers deals with war actions. The Forever War handles the aftereffects of war on the individual. E.E. Knight’s Vampire Earth series certainly addresses 4th Generation War against the alien, but focuses on tactics and military strategy and no small amount of courage and subterfuge, but, being so action-oriented, doesn’t spend a lot of time on the semiotics of war. I’m sure there may indeed be plenty of good examples in the genre; I simply haven’t read them. I do know of one very good exception. Going back to an earlier work – a John Campbell-inspired Heinlein book called Sixth Column – you realize just how the winning team in 4GW tends to be the one who seizes the initiative in language. Ardmore is the “PanAsian-American” protagonist who suffers the horrific invasion of his native North America by his own race, known collectively as the PanAsians. He loses much of his family in the persecutions, and decides to fight back. One problem: he has no military background. Worse: he is a former marketing executive. This weakness ultimately emerges as a great strategic strength the instant that it dawns on him: hopeless 3rd generation war tactics versus the conventional militarily superior invader state are not the only tactics available to the natives. He realized suddenly that he was thinking of the problem in direct terms again, in spite of his conscious knowledge that such an approach was futile. What he wanted was psychological jiu-jitsu — some way to turn their own strength against them. Misdirection — that was the idea! Whatever it was they expected him to do, don’t do it! The core idea, the hero discovers, is that the “psychological jiu-jitsu” lies in speaking unexpectedly and exploiting the assumptions of the conquering state-run army suffering incurable hubris at the highest levels, and inevitable demoralization on the ground. To say that the Oriental was disconcerted is to expose the inadequacy of language. He knew how to deal with opposition, but this whole-hearted cooperation left him without a plan; it was not in the rules. Despite it being a Heinlein, Sixth Column is not in my experience as widely read as his true post-War books, so I’ll leave it for you to discover on your own some of the other linguistic advantages that the natives employ in the attempted overthrow of crushing foreign rule. The point is that the language of 4GW is a proven contributor to Science Fiction ideas, and yet it seems – in my limited view – to be something fairly well overlooked in recent years. If you can think of other military linguistics novels in the genre, I’d love to hear about them. As the Lilliputians learned, in 3GW, Gulliver eventually stands up. Thanks for an increasingly excellent assortment of fiction and non-fiction. The future is indeed a little brighter because of those at Castalia House who endeavor to enlighten, entertain and educate. Thanks for bringing a “blue” site to fruition. Picked up On War yesterday, looking forward to it. Retired 18Z, 7th Grp. Looking forward to reading this. I would be surprised if Cordwainer Smith hadn’t written something in this field, given that he wrote, under his real name, a foundational text on psychological warfare. Of course, Linebarger was working for the State. I felt dirty reading his book, and I suspect he began to feel that way, too, from his later fiction. Me too, but I can’t think of a single one. Scanners Live In Vain certainly good have talked about language use in the resistance, but didn’t, and as many funny words as he came up with, you’d think he would have used some to storytelling advantage. The Programmed Man plays martial word games to an extent, and its lovely child The Mind Programmed sinks its teeth into the action of it all, but mostly they both boil down to straight up spy games, not the language used to propagate resistance and the degradation of enemy morale. It is about more than psychological warfare: it is about linguistical high ground. After all, when the state reduces the enemy descriptions to targets acquired, and the insurgent can live–or die for blood and tribe and family (and use that exact language in the process) the language of the state fails. The actor speaks circles into a noose around the neck of the bureaucracy, and every time the behemoth moves, it chokes itself. Really ought to be a way to get on the mailing list other than posting a comment…. agrees, but only because he wasn’t sure if he missed something in the instructions. I’d love to see more posts on this type of subject. Heinlein wasn’t prescient as much as he was correctly analytical of current times and trends. I bought Lind’s compilation and so far am enjoying it greatly. Looking forward to a long read.